Well, this page is fun to write. 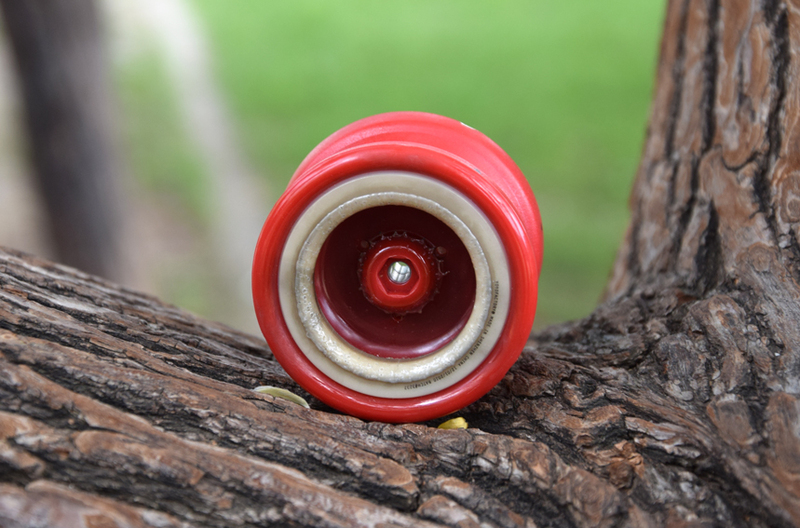 Looking back at all the prototypes and development problems we faced it is hard to think that we have a successful fire yoyo. The idea was born some time in 2012 during my last year at university. It just came to me out of nowhere. I wrote all of my thoughts about the fire yoyo on a piece of paper and didn’t go back to them until 2013. After all… there were final exams coming up, I was still in the UK, so couldn’t really do anything about it. One day in 2013 I was in the shop and had nothing to do. The usual suspects (in the shop) – Biser Lukich and George Stoyanov, were also in the there and we decided to try and lit a yoyo on fire. 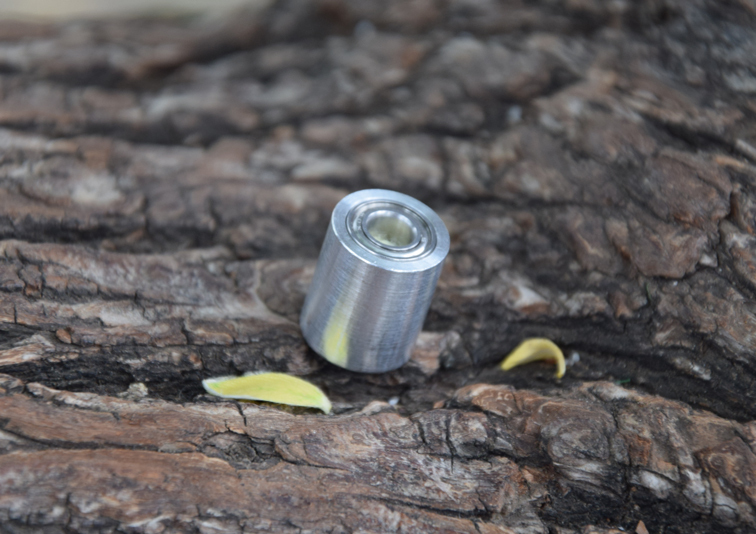 We grabbed a piece of kevlar string lying around and started experimenting with a Metal Drifter and PGM. They were very nice for our experiments since they had a long axle system. The kevlar string was not thick enough and didn’t last more than 20 seconds. Furthermore, the Metal Drifter god really hot after 2-3 throws and the PGM eventually melted. This was not the best of starts, but hey, for that 20 seconds we had a yoyo on fire… and it felt good. I got back to my hometown a week after that and discussed the details with my father. He is a mechanical engineer and has worked as an interior designer for the past… many years. We were trying to figure out a solution to the problems – the biggest one was that the kevlar is not enough and the fire dies out in 20 seconds. Then suddenly he came up with an amazing idea. He took a metal pen, unscrew it, put some kevlar inside the pen and a small wick going out of the pen. We soaked the kevlar inside and outside with some fuel and we lit it on fire. The results were very promising. First of all, the fire didn’t go out at all. We could move the pen around and it would still be on fire. The reason is that the fire “pulls” fuel from the kevlar which is soaked in fuel inside the pen. Think of a zippo lighter with a fuel tank and a small wick coming out. This was pretty much the same. 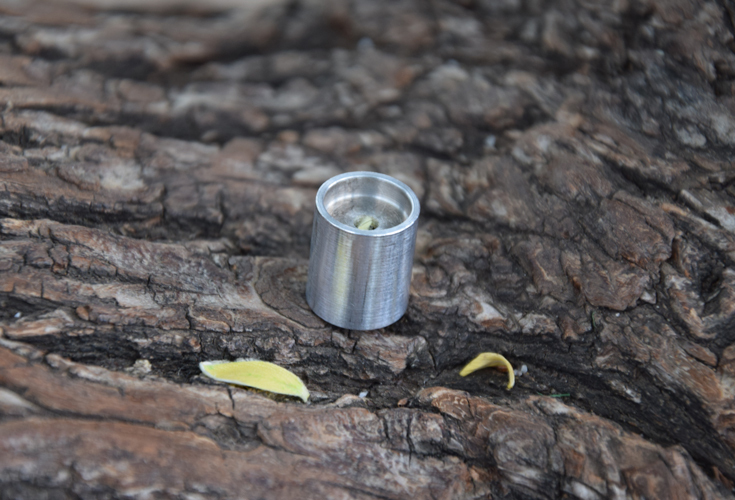 It was an amazing idea and it is incorporated in the final fire yoyo also. It definitely had a lot of flaws. Firstly, you had to spin it slowly so that the flame doesn’t go out right then. Secondly, it did get very warm in about a minute, which is not bad, but if it was a thinner yoyo it would be a lot quicker. The “plug” had a very small hole and it was hard to put enough kevlar out to make a proper wick. This was of course changed afterwards. Still, a big problem was the fact that you have to throw it very slowly so that the fire doesn’t go out. We tried another interesting approach for the “plugs”. We tried to make them as proper stack with a bearing and on the outer side to make a small shield for the wick so that wind doesn’t hit it directly. This failed miserably as the small bearing got so warm that it just broke into pieces. I was never really stuck for ideas on how to improve the yoyo. I decided to try a with a different material, one that would absorb heat. 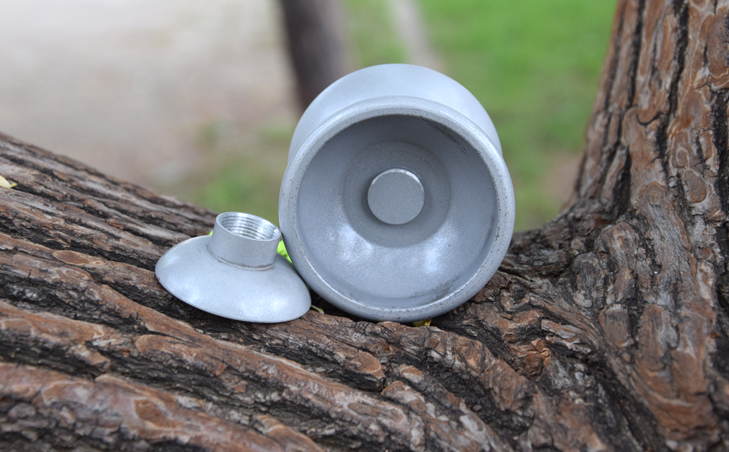 As you may know aluminum is one of the best heat conductors, which makes it really bad for a fire yoyo. 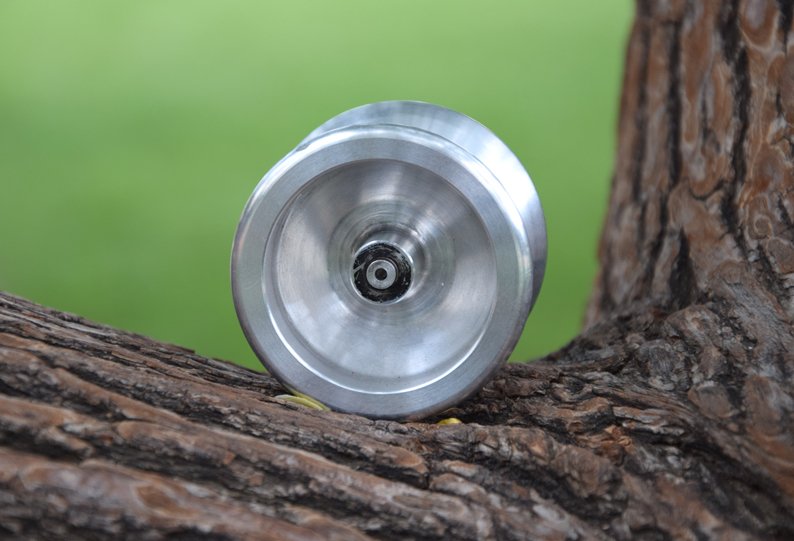 So what we tried next was to make it out of teflon (the yoyo felt a bit like made from delrin). It was a really good idea, but the yoyo was very very light (only 40 grams for a 64mm yoyo), then ended up melting (although it was really hard to achieve that) which would cause wobble eventually. At this point we all thought the fire yoyo was impossible to make. You had to be wearing gloves and playing under 30 seconds which was just out of the question. What followed was a couple of months of consultations. I was consulting PhDs, professors, coating experts, physicians, chemists. The options weren’t many. We tried a teflon coating. 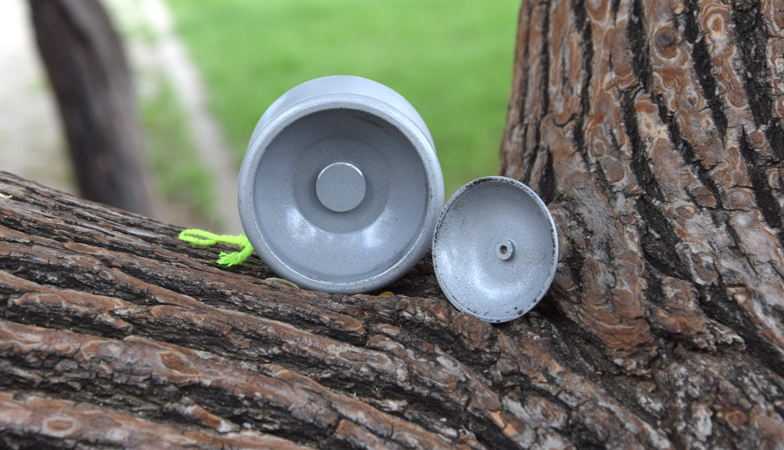 The yoyo looks beautiful, grinds really well, but has a horrible wobble and didn’t reduce heat at all. The owner of the manufacturing company, Vitalii, had an amazing design in mind which turned out to be the first successful prototype. 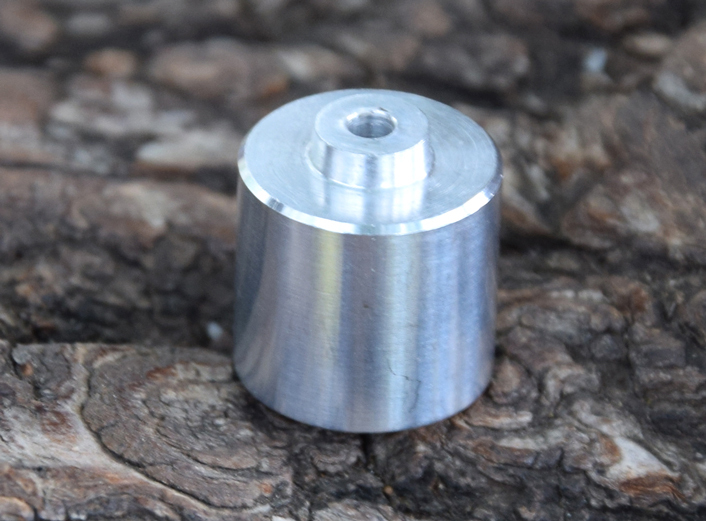 The “plug” was now a semi-shield which was protecting the yoyo from heat and protecting the fire from wind. The design, combined with the special coating I found in my research, ended up as the first candidate for a final product. This coating was really absorbing the heat very well and you could really play up to 90-120 seconds without it getting unbearably hot. Biser Lukich and I made a great video which you have probably seen already. We had small breaks for the yoyo to cool down, but as you can see, creating a video without using gloves is possible. One big problem was wobble. Although the prototype you see turned out to have a very small vibration in the end, when you put both “plugs” the vibration became huge! This was very very unfortunate as the coating was a huge breakthrough. Finally, I came up with a mixed idea that ended up to work… You have to wait for some pictures here, but they will be uploaded shortly.